Your cat doesn’t accept ordinary and you shouldn’t accept ordinary cat boarding. 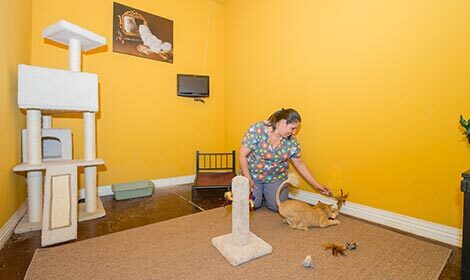 At LV Dog Resort, we care for your cat as if they were one of our own. 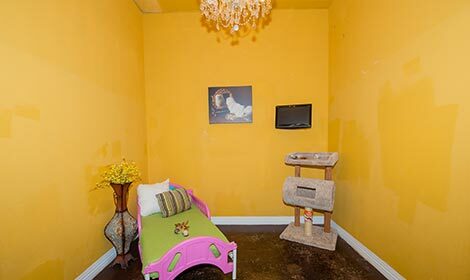 Our luxurious Las Vegas cat boarding suites are sure to be a favorite with you and your cat(s). Your pet will thoroughly enjoy the privacy in their luxurious boarding room away from our barking guests. Not to mention, they’ll enjoy climbing around their spacious room chasing toy mice and catnip to their heart’s content. Will my cat(s) be kept safely away from dog guests? Of course! Our cat suites are separated away from the dog boarding and dog daycare area for privacy and relaxation. All of our suites are spaciously built with and enclosed to ensure that your cat can sleep the day away without being woken up by occasional barking. Do you take a family of cats? Definitely! We would never want to separate your cats during their stay away from home and want to make sure that they can enjoy their luxurious stay at LV Dog Resort with their family. Depending on what suite you like, each additional cat is only $10 per night. What if I have a cat and dog that are inseparable? Hearing this makes us really happy! We love it when cats and dogs are able to get along and can become lifelong friends. We offer the option of allowing your cat(s) and dog(s) board together. Call us at (702) 985-8293 for more information about what suite might be best suited for your awesome pets. Can I bring my cat's favorite toy for them to play with during their stay? Absolutely! We of course also provide them with catnip, toys and playtime with a toy mouse. Is there a limit on how long they can stay? They can stay as long as you want! We recommend calling ahead of time, especially during the holiday season, to make sure that our 3 cat suites aren’t already booked. You can call us at (702) 985-8293 for more details.